FARMVILLE, Va. (WRIC) -- Improvements are expected to come to Longwood University's campus after the school received the largest donation in its history last week. 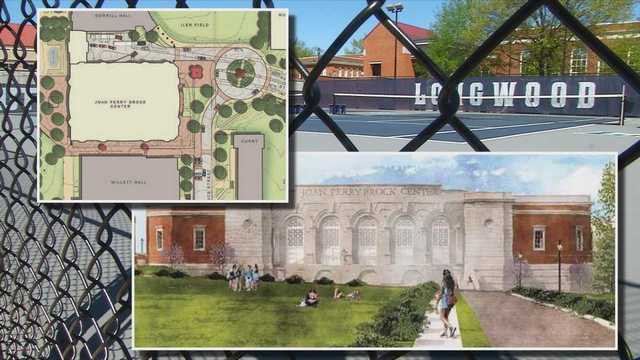 Philanthropist Joan Brock, who graduated from Longwood, donated $15 million for the construction of the university's new campus events center. The Joan Perry Brock Center, which will be built where the school's tennis courts are, will be the heart of the area. "There's no school more deserving than Longwood to have a center like that," the university's Student Government Association's junior class president Haleigh Pannell. It's a donation felt throughout the entire campus. "It's a pretty big deal, $15 million is a lot of money," said Juan Munoz, a redshirt freshman on Longwood's basketball team. "We wish it was built a little sooner." Longwood University President W. Taylor Reveley IV also spoke with 8News about the impact the donation will have on the students and staff. "It's a moment of just profound pride around campus," Reveley said. "The university and the town are working together, hand in glove, and with great spirit and enthusiasm for the successes we'll all have." The event center will replace the school's tennis courts on campus and host events along with each home basketball game. "The school's starting to believe in us and just everyone in the community is starting to believe in us as well and it's really a proud feeling for us," Munoz told 8News. Students say the continued construction on campus isn't ideal but the long-term benefit outweighs those concerns. "Having that kind of donation, having that kind of money and funds to put towards a project like this that's going to affect so many people is really worth it all in the end," Pannell said. Brock said she gave the donation because she wanted to give back to the school that gave her so much. Pannell said she understands exactly why Brock wanted to do this. "It's kind of like giving money towards building your house because you want it for your family," Pannell told 8News. Construction for the center is slated to begin this summer and wrap up by spring of 2022.